I have made a lot of angel food cakes in my time and this recipe is my favorite and is the easiest to make. Don't be intimidated with the egg whites, beating them until they stand on their own is easy and when you do it once you will never be intimidated again. Egg whites will be your friend, so to speak. I love angel food cake with strawberries and whipped cream. I think I love all cake with strawberries and whipped cream and if you read this blog, you will agree. This is What's Cookin on Beaty's Creek. Bake at 350' for 30 minutes on the lowest rack in your oven. 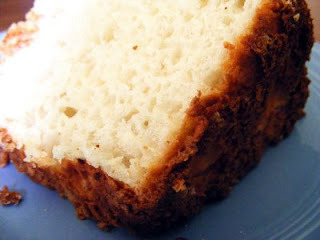 Also remember to use an ANGEL FOOD CAKE PAN AND NOT A BUNDT CAKE PAN. Yes, there is a difference.